Thanksgiving desserts are the highly anticipated tastes of any Turkey Day gathering. The turkey may be the star but Thanksgiving desserts are the supporting cast that make or break the dinner. But what about when we can’t spend Thanksgiving with family or friends? How can we still let them know we are thinking of them? The trick is to send Thanksgiving desserts that no one expects but everyone loves. The answer to sweetening their holiday is to surprise them with handcrafted Chocolate Pizza. They will start with dessert for sure! 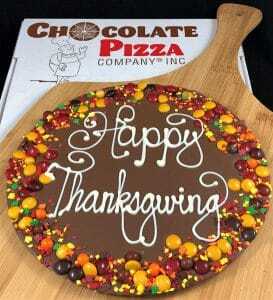 Chocolate Pizza Company in Marcellus, New York makes America’s premier trademarked Chocolate Pizza. The company starts by tempering the highest quality Swiss-style chocolate. This process manipulates temperature during melting to alter the properties of the chocolate. Tempering adds strength, shine and a velvety mouth-feel that distinguishes gourmet chocolate. But that is just the beginning. Chocolatiers then blend in homemade English toffee. The butter toffee is made on-site in small batches. The reason is simple – freshness and flavor. The finely ground toffee also adds an element of texture to the Chocolate Pizza. It blends harmoniously with the gourmet chocolate creating a base that becomes a chocolatier’s canvas. There are two choices for the border. The first is called Autumn Colors. Chocolate candy and sugar sprinkles in the season’s best browns, yellows, oranges and a touch of red make it as stunning as a Vermont hillside in fall. The second choice is an Autumn Avalanche border for a few dollars more. There are still the fall colored chocolate candies but much more. The avalanche border adds peanut butter cups and bite sized pieces of some candy favorites. It makes for a heavier Chocolate Pizza. Inside the border, chocolatiers hand-script the greeting in white chocolate. For the traditionalist, there is the “Happy Thanksgiving” greeting. But for those with a more whimsical personality, the “Give Thanks then Eat Chocolate” greeting is perfect. There are no mass-produced Chocolate Pizzas here only handcrafted confections. No two Chocolate Pizzas are the same. They are as individual as the people who give them. But that is the beauty of handmade. They are unique and that is something very few gifts offer these days. Chocolate Pizza – like its doughy namesake – is served in a pizza box. The custom box makes for a fun presentation and protects the Chocolate Pizza in transit. Chocolate Pizza Company ships this famous specialty all over the country and year-round. During warm months or for warm destinations, they use insulated shipping containers with frozen ice packs. The company ships tens of thousands of packages a year with less than 1 percent breakage. Of course, what goes better with pizza than wings. Not surprisingly, Chocolate Pizza has its pairing as well – Peanut Butter Wings. There is nothing like them on the market. Chocolate Pizza Company takes crisp, rippled potato chips and covers them in creamy peanut butter. But it is drenching them in rich milk or dark chocolate that completes the salty-sweet masterpiece. Glitter magazine raves, “You have not lived until you’ve tried these.” And they are so right. Together, Chocolate Pizza and Peanut Butter Wings are Thanksgiving desserts that no one expects. But everyone loves. Men and women love the idea. Families and kids love the idea. Coworkers and the boss love the idea. 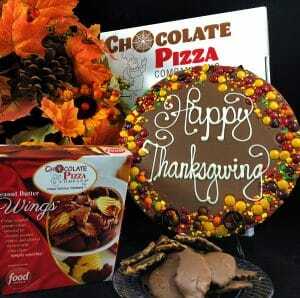 Chocolate Pizza and Peanut Butter Wings are a universal home-run in the Thanksgiving desserts category. 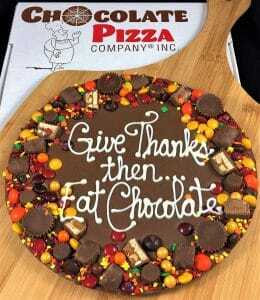 Featured on Food Network, Hallmark Channel, CNBC and CMT, Chocolate Pizza Company is nationally recognized. Owner, Ryan Novak, has also appeared in Forbes, People and Entrepreneur magazines. The young entrepreneur started with the company as a dishwasher when he was 15 years-old. He was the owner at age 21. Ryan’s vision has transformed a small-town chocolate shop into an emerging national brand.